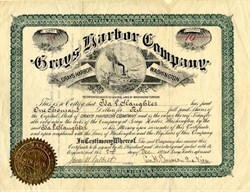 Beautiful certificate from the Grays Harbor Company issued in 1890. This historic document was printed by Brown, Treacy & Company and has an ornate border around it with a vignette of a steamship in the harbor. This item has the signatures of the Company's President, George Emerson and Secretary, James Gilbert and is over 118 years old. Wear on folds. Fine. George Emerson, the man generally considered to be the founder of Hoquiam, Washington. The Grays Harbor Company was comprised of Henry Heermans and George Emerson, both of Hoquiam, along with Heermans' long-time friend and business parter from Duluth, Minnesota Chester Congdon. The Grays Harbor Company's construction loan was to cover the costs of preparing the roadbed for the laying of rails, including the cost of bridges over the Wishkah and Hoquiam Rivers. The loan was to be repaid, with 3% interest, out of non-lumber gross earnings from this extension. When Hoquiam was reached the many mills and industries along the waterfront in Aberdeen and Hoquiam were accessible to the NP. The success of this line can be viewed in the traffic data for 1900 shown below.